Last night the families of those killed and wounded on 30 January 1972 met for the final time before the report into the killings is published. In a show of solidarity last night, more than fifty relatives stood together in Derry’s Bogside. Speaking ahead of their meeting, one of the most high profile Bloody Sunday campaigners, John Kelly slammed what he described as the “mercenary” attitude of some British newspapers who have speculated on the findings of the Saville Report in recent days. Reports that Saville will return “some” findings of “unlawful killing”, have fuelled the anxieties of the families ahead of tomorrow’s publication. “This approach is totally insensitive and the material which has been printed is certainly not helpful. These headlines are put out there to sell papers and the families are doing their best to ignore all speculation until we see the report,” he said. 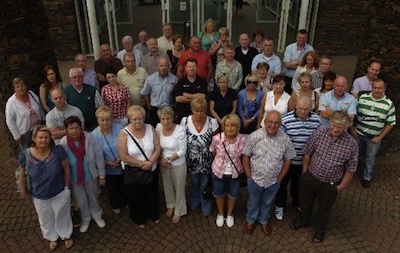 The families have always rejected the original Widgery inquiry into the killings, which backed British claims that some of the victims were armed at the time they were killed. The Widgery inquiry had been exposed as a whitewash long before then British Prime Minister Tony Blair ordered a new inquiry in 1998. Mr Kelly, whose brother Michael was one of those shot dead, expressed his heartfelt thanks to the people of Derry for their support over the past 38 years, and says he wants people in the city to come out in their thousands on Tuesday to stand behind the families of those killed. He continued: “We’re all looking forward to Tuesday when we will finally have an answer after 38 and a half years, but we are also very anxious and very nervous. We’ll try to be as calm as we can be on the day but none of us will get much sleep the night before. We’ll be turning everything over in our heads in the next few days and hoping and praying that we get the answer we want,” he said. Speaking at the weekend, British justice secretary Ken Clarke also caused considerable offence when described the Saville inquiry as “ludicrously out of hand”, and a “disaster in terms of time and expense”. Mr Clarke’s comments were described as disgraceful by Sinn Fein Assembly member Raymond McCartney, who added they were part of “British political mindset that has given us the cover-up of the murders on Bloody Sunday and concealment of the British policy of collusion over many decades”. Lawyers and representatives from the Bloody Sunday families, as well as the soldiers who carried out the killings, will be permitted advance sight of the report tomorrow, in Derry and London respectively. Mr Kelly said the sense of expectation and anxiety had spread to much of Derry city. “This isn’t just about the families, it’s not just about the injured, it’s about the whole city of Derry, because in a sense the whole city was murdered that day. We carry that [burden] and the whole city carries it right to this very day,” said Mr Kelly. In a symbolic gesture, the families will complete the march on which their loved ones set out 38 years ago by walking from the Bogside to Guildhall Square tomorrow. Relatives have urged supporters to join them at the Bloody Sunday monument at 2.30pm for the short walk to Guildhall Square. Tony Doherty, whose father Patrick was shot dead in 1972, said other bereaved relatives were welcome. “We would like to invite families throughout the north who have also lost loved ones to join us and we would request that everyone fall in behind the Bloody Sunday family members,” he said. A sister of one of the Bloody Sunday dead will grip the bloodstained handkerchief waved on the day as she is handed the long-awaited report into the killings, she revealed today. The image of four men carrying 17-year-old Jackie Duddy, the first person to be killed on the day, alongside the then Fr Edward Daly holding the hanky aloft as a white flag, has become the enduring image of the day. The plain white handkerchief bearing the name “Fr E Daly’ is now normally held in a museum in the Bogside. “We’ll all need the handkerchief,” she said. Fr Daly, now a bishop (retired), has also pledged to be at Guildhall Square tomorrow as the report is published. The Duddy family have held on to it since, until it was donated to a museum last year. The testimony of Dr Daly and other clergymen who were in the Bogside when the paratroopers started firing was crucial in efforts to counter the official British government account that those killed were gunmen and bombers. Julie-Ann Campbell, niece of Jackie Duddy, is helping co-ordinate arrangements for tomorrow’s events in Derry. Ms Campbell said that trauma-support workers, first-aid personnel and a doctor would be on hand in the Guildhall to provide assistance to the families if necessary. She added that the 56 family representatives of the 28 killed and wounded who will initially view the document will make a silent procession from Rossville Street through William Street and onto the Guildhall tomorrow morning to symbolically mark the original intended destination of the banned march. A similar larger march will take place in the afternoon shortly before the report is released. Thousands of people including members of the national and international media are expected to converge on Guildhall Square at 3.30pm where giant screens will broadcast British Prime Minister David Cameron’s speech to the House of Commons on the report’s findings. Relatives of those killed and wounded will then give their reaction to the long awaited report. Extracts from the report will be published here tomorrow as soon as it becomes available. Meanwhile, white line vigils are taking place in Belfast this evening in support of the Bloody Sunday families as well as in support of protests called for by the families of other British massacres. She said people should stand “shoulder to shoulder” with the relatives of those victims as they await the publication of the Saville Report. SInn Fein president Gerry Adams said the people of Ireland had waited for 38 years for the British government to tell the truth about Bloody Sunday.